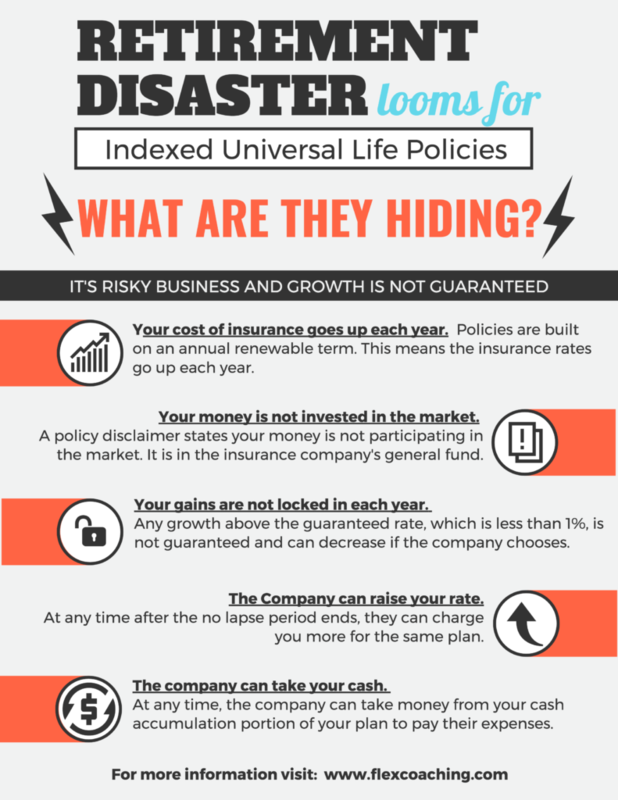 Equity Indexed Universal Life Policies are complicated products designed to help insurance companies compete in a marketplace where consumers have easy access to a large variety of investment options. The days of whole life policies being able to provide the growth that satisfies consumers are all but gone. So, the insurance companies had to develop a product that follows the law but provides some higher growth options. But what they ended up with has a veil of risk and dishonesty that both agents and consumers alike are mostly unaware of. What are they hiding? It’s risky business and growth is not guaranteed. Your money is not invested in the market. A policy disclaimer states your money is not participating in the market. It is in the insurance company’s general fund. Your gains are not locked in each year. Any growth above the guaranteed rate, which is less than 1%, is not guaranteed and can decrease if the company chooses. The company can raise your rate. At any time after the no lapse period ends, they can charge you more for the same plan. The company can take your cash. At any time, the company can take money from your cash accumulation portion of your plan to pay their expenses. Don’t believe us? You don’t have to… read or watch any of the news stories below. Want even more? Here are items highlighted in an actual policy outlining these issues. Here is an illustration showing the guaranteed values dropping to 0.00 after just 15 years. The Non Guaranteed values are still in place, which means if the company does not make enough interest the policy holders will have to pay more. That means there are no guarantees in this policy. This table in a policy displays the increasing annual renewable rates. The policy disclaimer showing the money is not participating in the market. The policy disclaimer revealing the future possibility the policy holder will have to pay more to keep the policy in place. The policy disclaimer stating that it may require the policy holder to pay more in order to keep the guaranteed values in place. This means that after the no lapse period even the guaranteed values are not guaranteed. The policy disclaimer stating that the insurance company has the right to change the rates based purely on the companies speculation. We know this information can be shocking to some, while others will still decided to continue on the path to destruction with IUL’s. Our hope is to bring light to a dark subject and hope that those who want our have a way. Feel free to contact us if you have any questions or are looking for an alternative.